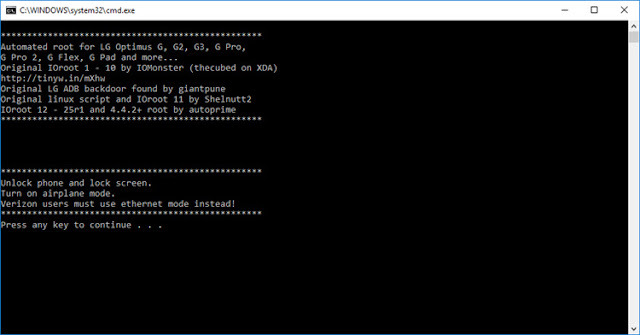 ioRoot Tool is a Windows utility tool that supports rooting LG Android devices (including LG G2 & G3). If you are using an LG Android smartphone or tablet, you can use this tool to gain root access on your device quickly. In this page, we have provided download links for all versions of the ioRoot tool. 1) Supports All LG Devices: You can use ioRoot tool to gain root access on almost all LG devices. Some of the most famous LG devices you can root using this tool are: LG G Pad 8.3, LG G Pro 2 (supports up to Android version 4.4.2), LG G Pro (supports up to Android version 4.4.2), LG G Flex, LG G3 (supports up to Android version 4.4.2), LG G2 & LG Optimus G.
2) One Click Rooting Tool: ioRoot Tool is a one-click rooting tool, i.e., you can root your LG smartphone or tablet in just a single click while using this tool. 4) Supports All Windows Versions: You can use this tool on all versions of Windows operating system, i.e., Windows 10, Windows 8.1, Windows 8, Windows 7, Windows Vista and Windows XP. 1) ioRoot tool can only be used to gain root access on LG smartphones and tablets. So, if you are using a different branded Android device, you can’t use this tool to gain root access. 2) This rooting tool has been discontinued, i.e., you won’t get any support for this tool from the developers. Also, there won’t be any future updates. 3) The credits for this tool development goes to different developers: IOMonster developed version 2-10, Shelnutt2developed version 11 and Autoprime developed version 22 & 25. 4) If you encounter any issues while using this rooting, kindly get in touch with using the comments section given below.